Despite the cliché “worse than a rabid wolverine” there has never actually been a documented case of a rabid wolverine. Until now. Veterinarian Dr. Kimberlee Beckmen with the Alaska Department of Fish and Game completed a necropsy of a wolverine that was found dead on the North Slope. 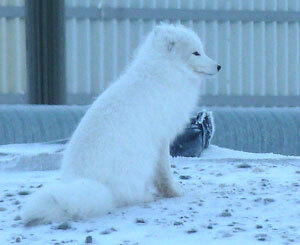 The Centers for Disease Control confirmed it was infected with a strain of arctic fox rabies. The story starts in June, when state wildlife biologists Lincoln Parrett and Patrick Jones were flying in a helicopter about 25 miles northwest of Umiat. They were visiting sites where caribou calves were killed by predators, part of caribou survey and research work, when they spotted the dead wolverine. It was completely intact and had not been scavenged. Parrett called it a serendipitous finding. Beckmen had previously put the word out to biologists that she wanted to examine dead wolverines if they became available. “I’ve been asking for them specifically because I want to learn more about their diseases, and the parasite loads of wolverines,” she said. Beckmen also saw no obvious cause of death. The wolverine had only a single minor injury. Beckmen said the wolverine was in estrous when it died, and in that area, that usually occurs in May, implying the animal had died a month earlier and frozen shortly afterward. Another clue reinforced this: the wolverine had a goose egg in her stomach, and by June geese eggs have hatched. In addition to studying parasites, Beckmen is very interested in rabies. The Division of Wildlife Conservation has a disease surveillance program and is certified to test wildlife for rabies using a new screening method that is simpler than the traditional method. The Department of Health and Social Services’ Section of Epidemiology (the Alaska State Virology Laboratory in Fairbanks) generally tests for rabies if there has been a potential exposure of a person to rabies, typically a bite. Animals may also be submitted for testing if there is community concern, if a domestic animal has been exposed, or if there is reason to believe the virus is appearing in a new region. Rabies in Alaska is endemic (meaning always present) in a small number of arctic fox only along Alaska’s coast but spills over frequently to red fox, sometimes in epidemic numbers of cases. The highest number of cases in foxes occurs in late winter, especially in the year after a high lemming/vole population explosion, which leads to increased fox numbers. An outbreak occurred in 1990 and affected red fox in Bristol Bay and the North Slope, arctic fox in Atqasuk and Barrow, and wolves around Ambler. Rabid foxes will enter villages and attack dogs left out on chains or running free, and it is mainly from the dogs that people are at risk. Thus, all dogs need to be vaccinated to protect people from fox rabies. After foxes, wolves are the animal in Alaska most likely to attack dogs or people when rabid. In two separate incidents in 1942 and 1943, a Native hunter in Noorvik and a 10-year-old boy in Wainwright survived attacks by rabid wolves and later died from rabies. Since 1971, more than 100 wolves have been tested and of those, 24 have been positive for rabies. A pack of nine wolves was found dead in Northeastern Alaska during the spring of 1985, and five of the animals tested positive for rabies. In 1977, biologist Richard Chapman was studying a pack of 10 wolves in the Arctic National Wildlife Refuge and observed one member fighting with his packmates. The next day that wolf approached him at his camp behaving in an increasing threatening manner; he shot it and it tested positive for rabies. A month later he found six dead wolves near his camp, two were tested and both were positive for rabies. 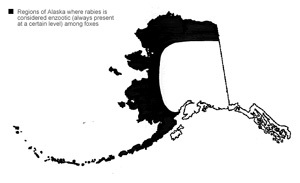 Regions of Alaska where fox rabies is considered to be endemic - always present at some level. One of the most recent incidents was in 2007: a pack of wolves attacked dogs in a dog yard in Marshall and killed six. One of the wolves was killed and it tested positive for rabies. Unfortunately, many dogs in the village that were exposed to the wolves had not been vaccinated for rabies and had to be killed to protect the village. 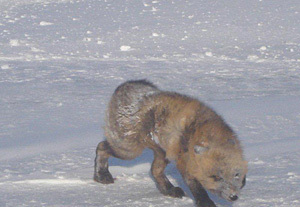 Beckmen said ADFG is now capable of testing more wildlife and is putting a concerted effort into learning if rabies is present in Alaska besides the North Slope and western coastal areas. In the past two years Beckmen has tested more than 600 animals, including hundreds of foxes and more than 100 wolves, 19 bats and four wolverines – including the recent find. Beckmen has also tested road-killed moose that were also being checked out for Chronic Wasting Disease. In many cases the animals are found dead, hit by vehicles, killed in defense of life and property, killed in predator control programs or donated by trappers. “We found 2.8 percent positive for rabies, but these were all foxes except the one wolverine,” she said. Beckmen said that in addition to the disease surveillance program, ADF&G is involved in collaborative research with Dr. Karsten Hueffer at the University of Alaska Fairbanks to examine rabies transmission dynamics with the expanding red fox populations displacing arctic fox in a changing climate. More than 330 trapper-killed “normal” foxes from the Bethel area were examined for rabies and six were positive (1.8%). “We want to increase trapper awareness about rabies, and make sure they wear gloves when skinning, and if they cut themselves, contact their health care provider so the fox’s head can be submitted to the Department of Health and Social Services for testing,” Beckmen said. All mammals are considered susceptible to rabies but not all are efficient transmitters of the virus. The amount of the virus in an animal’s saliva is a big factor - some species of mustelids (weasels) and most rodents tend to shed virus in saliva at a lower rate than other species such as bats, foxes and dogs. Rabies has been found in animals that people don’t usually associate with the disease such as caribou, reindeer, white-tailed deer, river otter, domestic and wild cats, polar bear and black bear. This fall, there were two separate cases of aggressive rabid beavers reported in Virginia. “Rodent bites aren’t usually considered a risk and people aren’t usually given vaccinations even when the rodent isn’t tested. However, the recent beaver attacks remind us that rodents do get it and die from it,” Beckmen said. Not every animal that gets exposed to the rabies virus becomes infected. The incubation period can range from months to years, so the animal may die of something else, may not have gotten large enough virus dose and so was able to mount an immune response, may have already had antibodies from previous exposure or vaccination, or the species seems to be resistant (but none are wholly immune) to certain strains. However, once clinical signs appear, rabies is fatal. The early symptoms of rabies include fever, headache, and general weakness or discomfort. As the disease progresses, more specific symptoms appear and may include insomnia, anxiety, confusion, slight or partial paralysis, excitation, hallucinations, agitation, increased salivation, difficulty swallowing, and hydrophobia (fear of water). Death usually occurs within days of the onset of these symptoms. In the U.S. the number of deaths from rabies has declined from more than 100 per year in the 1800s to just one or two a year. Fatalities typically occur in people who fail to seek medical attention, usually because they were unaware of the exposure. Arctic fox. Rabies in Alaska is always present in a small number of arctic fox only along Alaska’s coast but spills over frequently to red fox, sometimes in epidemic numbers of cases. The disease becomes fatal when the virus reaches the brain. So the progression depends on where a person has been bitten, the disease can progress much faster if someone bitten on the face than on than foot. There are different strains of rabies, named for the natural host that sustains it in the ecosystem or where it originally evolved. In the Lower 48, most rabies is either skunk, raccoon or bat rabies. Some strains of rabies are more virulent than others, with the arctic fox strain endemic to Alaska being of low virulence and the red bat rabies (detected in a Keen’s long eared bat on Prince of Wales Island in 2006) being highly virulent. It is notable that the only other case of rabies in a bat in Alaska was in 1993, in a little brown bat near Ketchikan which was infected with a highly virulent silver-haired bat rabies strain. That risk is another reason why it is critical that people do not pick up or try to ‘save’ bats that appear to be sick or can’t fly. Worldwide, rabies kills about 55,000 people annually, and according to the Centers for Disease Control, in about 99 percent of the cases it is transmitted by dogs. About 31,000 people die from rabies each year in Asia and about 24,000 people in Africa. Most of the deaths in Asia are in India - 20,000 people a year die from rabies in India, which passed a law in 2001 that forbids killing stray dogs. The New York Times reported in an Aug. 6, 2012, article that tens of millions stray dogs roam free in India, mostly feeding on garbage, and bite millions of people each year. In the United States, animal control and vaccination programs have effectively eliminated the dog rabies strain. In several countries, including Australia and Japan, rabies carried by terrestrial animals has been eliminated entirely. The true dog rabies virus has been eliminated in the US, but dogs are still susceptible to the other rabies viruses and can effectively transmit rabies. Current legal requirements for vaccinating dogs against rabies are to protect people from getting wildlife rabies transmitted by the dog. Rabies manifests in two different forms, called furious rabies and dumb rabies. Animals with furious rabies exhibit aggressive behavior including attacking inanimate objects and biting anything that moves. The dumb form (named when the term was commonly used to mean speechless) is less dramatic but more common especially in horses and cows. The cow may appear to have something caught in its throat but that is actually a paralysis that prevents it from swallowing saliva. Wild animals infected lose their natural fear of people; appear lethargic and wobbly or partially paralyzed. Riley Woodford is the editor of Alaska Fish and Wildlife News and the producer of the Sounds Wild radio program. Dr. Kimberlee Beckmen is a veterinarian withe the Division of Wildlife Conservation.